Feel-good movement integrates the mind, body and spirit. It stimulates our awareness, tames our thoughts, frees our bodies and enlivens our spirits. In doing so, it allows us to have a more unified conscious experience that is oriented around self-directed pleasing sensation. Stress is a major factor in the distancing of our awareness from our bodies. When we experience stress, all extraneous energy becomes re-oriented towards the particular stress-inducing challenge. Stress-filed trauma and traumatic experiences amplify the disconnect between body and mind. They increase our tendency to divorce the caring attention of our minds from our bodies. This is partially why the traumatic diagnosis of cancer can exacerbate or induce feelings of isolation and numbness. Feel-good and expressive movement can help increase health and mental resilience in the midst of the trauma of cancer. A cancer diagnosis is an extremely stressful event which triggers significant anxiety and depression. It can take our minds hostage, force us into negative thinking, or makes it hard for us to think straight at all. In doing so, it can darken the landscape of our minds, making us hyper-focus on our worries. It can also leave us feeling ungrounded due to the extreme existential threat that accompanies potentially terminal illnesses. A lot of these experiences are due to high levels of activation of our innate stress system, also known as the HPA axis. HPA axis activation literally changes where blood is flowing in our brains, therefore feeding activity in certain regions and minimizing activity in others. This shift is partially responsible for our mental fog and strong disconnect from our bodies. Movement, on the other hand, creates a very different neural picture. It steers energy towards the brain regions responsible for creativity and sensory experience and away from our stress-system. This is experienced as a reconciliation of focus and attention, from ideas and specific thoughts towards physical sensation and mental play. In doing so, movement can change our mental landscape and open up our thought space to non-cancer related areas. It can also support us in processing some of our worries because it allows us to experience how they are affecting us physically. It it can ground us in the present and provide us with a stable and unified perspective point. With a stable perspective that is grounded in our bodies and the present moment, we are then often capable of envisioning how we can move forward one day at a time. Cancer itself, the mental stress of the diagnosis and the physical stress of the treatment can all majorly impact our physical structures and what signals they’re sending to our brains. Pain, discomfort, fatigue and weakness are often in the forefront of our body-awareness. We might feel painfully aware of our deconditioning and avoidant of movement in general. Or, we might just totally disconnect from our bodies, as a way of tuning out from these negative aspects. Either way, our relationship with our physicality can definitely become dysfunctional amongst all of the cancer-related stress. With all of this being said, it can be really beneficial to give our structure some caring attention. Reminding ourselves of the reality that our bodies can feel good and that we have the power to initiate positive sensations can be really inspiring. As such, it can place us in a state of acceptance instead of avoidance. It can also literally help relieve some of our physical tension and discomfort. It can support healthy movement of our blood and lymph and facilitate greater physical resilience. Feel-good movement is often extremely powerful in its ability to calm our nervous systems. It is a form of self-soothing and self-reinvigoration. As simple as it is, it can be a really powerful way to lighten our emotions or recover our emotional stability. At the same time, it can help us connect to our drive for life in way which is healing and not stress-inducing. This is especially true when our movements are performed to pleasing music. Feel-good movement reduces stress in a way that can simultaneously bring our focus to the present moment but also connect us with our body memory of enjoyable past experiences. It can give us hope and connect us to our joy. 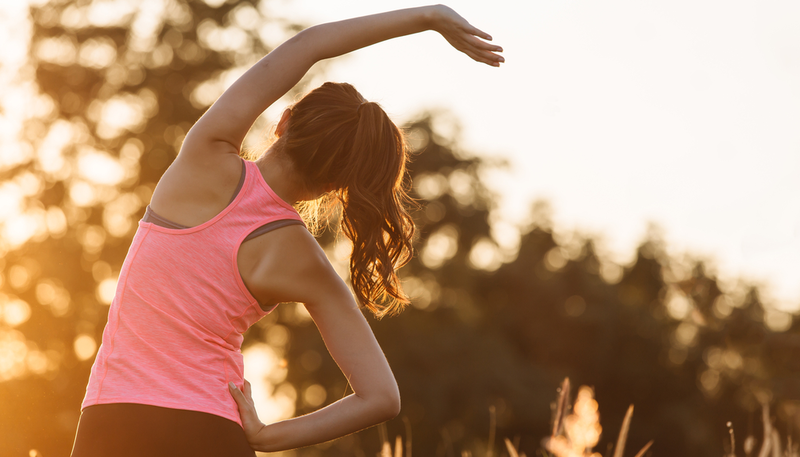 We’ve done a lot of talking about the benefits of movement, but now it’s time to actually experience these benefits. 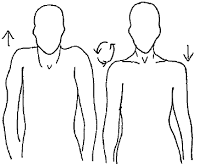 Below are some suggested feel-good movements with pictures and descriptions. (Proceed after consulting with your doctor to make sure that this is right for you). These movements should be done with the timing that feels best and for as long as feels appropriate. Music can greatly help to facilitate internal ease and connection. For this one, we’ll go on our hands and knees. If our knees are sensitive, this can be done on a bed or with a soft cushion underneath us. The movement will be arching and curving our spines towards and away from the floor. Let’s take our time and enjoy these natural movements. We can also shift side-to-side if that feels good. After our cat and cow exercise, we can roll onto our backs. Then, we can bend one knee and bring that knee across our bodies, allowing our spine to rotate along with the knee. Finally, we can turn our heads to the opposite side of the knee. We can breathe into this position for as long as feels good and then slowly switch sides before returning to the first side again. 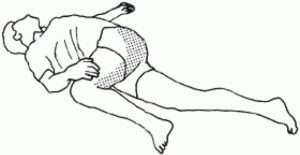 For this one, we can find ourselves in a comfortable standing or seated position. We’re going to roll our shoulders forward, up towards our ears, back, and then down away from our ears. We can repeat as many times as feels good and then we can switch directions and begin the roll with moving our shoulders back. We can remain seated or standing for this exercise. We’ll begin by reaching our arms up to the ceiling and then, clasping our hands together. Let’s breathe for about 30 seconds while we continue to reach up. 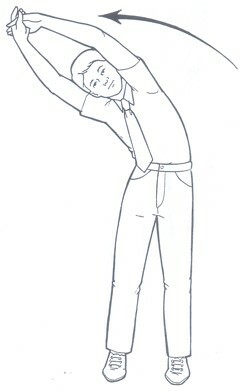 Then, we can side-bend our spines over to the left and reach our right hand towards the left, as we breathe. When we’re ready, we can switch sides. Finally, we can return to center and let our arms drop down by our sides. We can repeat this cycle as many times as feels good. This last one, like all previous movements, is totally optional. This is as simple as it sounds. We can find a place where we feel comfortable and turn on some music that connects us with ourselves, our joy and our inspiration. 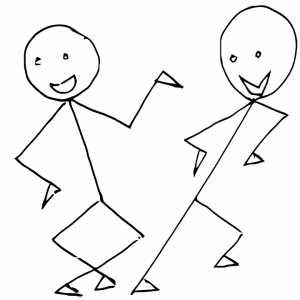 Then, we can allow ourselves to dance to the music in any way that feels authentic, fun and personally expressive. In the midst of stress, it’s more important than ever to connect to, care for and celebrate our bodies, even if it feels like they may be failing us. We can be aware of our fears and worries, but allow them to pass—instead—our mental landscape. Via these and similar movements, we can care for our bodies and strengthen our spirits.